In 1931, the young Kurt Gödel published his First Incompleteness Theorem, which tells us that, for any sufficiently rich theory of arithmetic, there are some arithmetical truths the theory cannot prove. This remarkable result is among the most intriguing (and most misunderstood) in logic. Gödel also outlined an equally significant Second Incompleteness Theorem. How are these Theorems established, and why do they matter? Peter Smith answers these questions by presenting an unusual variety of proofs for the First Theorem, showing how to prove the Second Theorem, and exploring a family of related results (including some not easily available elsewhere). The formal explanations are interwoven with discussions of the wider significance of the two Theorems. This book - extensively rewritten for its second edition - will be accessible to philosophy students with a limited formal background. It is equally suitable for mathematics students taking a first course in mathematical logic. An extensively rewritten second edition of this best-selling standard text for graduates and upper-level undergraduate students of logic, philosophy of mathematics, and pure mathematics. 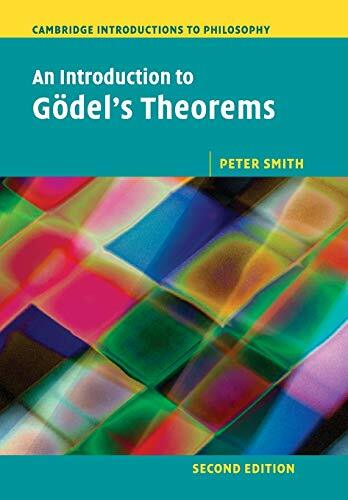 A clear and accessible treatment of Gödel's famous, intriguing, but much misunderstood incompleteness theorems. Peter Smith was formerly Senior Lecturer in Philosophy at the University of Cambridge. His books include Explaining Chaos (1998) and An Introduction to Formal Logic (2003) and he is also a former editor of the journal Analysis. 6. 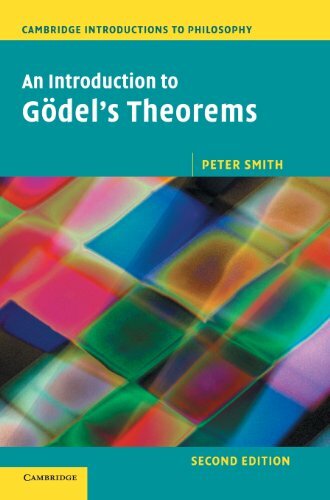 An Introduction to Gödel's Theorems: Volume 0, Part 0 2nd Edition.